I just installed Version: 2.2.0-rc1 for Windows. There is a problem with relative addressing. When specifying a negative distance I get a Syntax Error. For example, I select the line tool, 2 point. Select my first position by snap or absolute position. Then if I want to move downward (@0,-5) I get the error. If I want to move to the left (@-3,0) I get the error. Positive amounts work normally (@2,6, @0,3) but not the negative. The same is true with polar addressing: negative numbers not allowed. @1<-90 gets an error but @1<270 works. I cannot reproduce this, works as it should, Windows version too. I also tried @2,5 and then again with @2<90 and both worked correctly and the line segment was completed. This works for me too, with the latest 2.2.0-rc1-19. I tried both, negative on the alpha keys and on the num pad, both worked. Have you tried both keys too? Maybe it's related with language settings. Which language settings do you have? The command line is parsed with the muparser library, where we haven't any changes for a while now. So I assume this is not related to recent source code changes. I tried both sets of keys, keypad and upper row, and had the same result. Also, the calc command no longer works. Returns "Unknown command." My language is US English. My computer is a Lenovo Ideapad 320. I can reinstall version 2.1.3 and everythings works. I'm using "English, Canada UTF-8" for the system and "English" within LibreCAD's application preferences. Also, I have a second PC where I'm running 2.2.0-alpha and it generates the same errors. 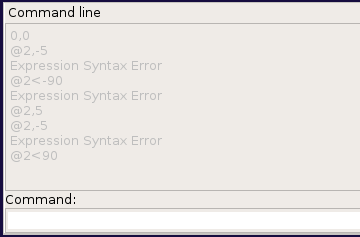 I also tried setting the application preferences to german for the command line language with the same resulting errors. So I have to look if there are already some debug messages which may help or if we have to implement an error message which gives more information about the cause of this. I've made a windows executable with some debug output in the command history, as I can't reproduce this. Copy the file into your LibreCAD application folder (where the regular installed files are) and run it. Then test the relative inputs and share the output in the command history. Copy/paste should work for this. I download and compiled RC1 on Debian. Is the debug code available on github? No, these changes will not go to github repo, it's only for bug hunting. If you need help with git, we can give it a try. I did compile LibreCAD successfully prior to applying the patch. Running qmake -r doesn't use any source files, only the pro files. And pro files were not touched by the patch. This looks like an issue with Qt. Maybe you have uninstalled accidentally the Qt SVG libs or switched to another Qt version? I downloaded the file and then copied it to C:\Program Files (x86)\LibreCAD. When I ran it, it could not find some DLL files. For example, QT5Cored.dll. I copied QT5Core.dll and named it QT5Cored.dll. I did this for several DLL files. Then I ran the program. Nothing happened. I started LibreCAD (version 2.2.0rc1) and I did not notice any difference. Did I do something wrong? @Philip, the QT5Cored.dll is the debug version of QT5Core.dll, seems to be my fault, I sent you a debug exe file. I surely switched something to release build, but don't know what now. @Gary_S, well done! Sadly, this is not what I hoped to see. This eliminates issues in LibreCAD code, as everything looks fine, no character code issue. Have to dig deeper into muparser library then. I did not receive a new file. Will it be by email, message, etc? I have checked my spam folder. I didn't sent you a new file. I meant the file download contains a debug exe file. That's why it missed Qt5Cored.dll. As Gary_S posted what I was looking for, I didn't make a new windows file for you. I don't expect different result from windows executable. We can give it a new try when I've added some more output in muparser library. I'll give you a note here when it is ready. OK. I misread your post. Thank you for all the work you put into this. I noted when I compiled LibreCAD that it was "Using external muparser". I looked at the last modified date of muparser (/usr/lib/x86_64-linux-gnu//usr/lib/x86_64-linux-gnu/libmuparser.so.2.2.3) and it is 23 Aug 2015. I used a previous version of LibreCAD (prior to 2.2.0 alpha/RC1 - what was/is available via the Ubuntu PPA, 2.1.x maybe), but that was certainly a version released since 2015. The earlier version of LibreCAD doesn't have this problem.